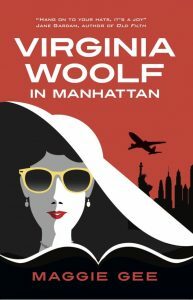 There’s almost no book as suited to republishing (in another year, in another format) than Maggie Gee’s Virginia Woolf in Manhattan. First published in 2014, it is Gee’s twelfth novel. In 2012, after her eleventh novel, she was awarded the Order of the British Empire and is henceforth Dame Maggie Gee. In 2014 when the hard cover version of Virginia Woolf in Manhattan appeared, it was longlisted for the prestigious Folio Prize. There is some evidence that the hard cover of Virginia Woolf in Manhattan is not completely identical to the paperback; published reviews indicate that there were possibly revisions made for this edition. In the paperback, the conference plays out fully and Virginia makes sweet love to one Ahmet and quite possibly to a pretty chambermaid as well. For Virginia Woolf, a victim of childhood sexual abuse, to celebrate her resurrection with a healed and passionate body, well, as Chaucer would have it, “There is namore to say.” Maybe there’s no sense in book reviews. What is undisputed – to me at least – is that Virginia Woolf in Manhattan is absolutely, hands-down the slickest literary fantasy you’ll read in a long time. You don’t have to be a Woolf scholar to love it, although I presumably missed many a joke by not being one myself. The premise is that on the strength of her promise to return Virginia to Leonard, a renowned, self-absorbed, literary-careerist-and-hands-off-parent (Angela Lamb) resurrects the flesh and blood Virginia Woolf, unbathed and still smelling of pond water, in a restricted-access reading room of the New York Public Library (12). Gee clearly chronicles three intertwined stories: Virginia’s, Angela’s, and Angela’s daughter Gerda’s. In addition to the engaging plot, Gee’s writing is full of poetry, longing, and literary parallels. These latter really are the crème de la crème – they are extra in the best sense of the word – they are lagniappe. Then there’s parallel with Virginia Woolf’s own To the Lighthouse. The Ramsays go the lighthouse while our three protagonists go to the Aja Sophia. There’s the anti-alignment of poetry and the internet, of yearning and busyness, of motherhood and barrenness…one could go on and on. One delicate whorl of meaning after another is juxtaposed to a rhyme or an off-rhyme of itself. Having so greatly enjoyed this novel, I’m going to ask you to do three things on its behalf. The next time someone looks down their nose at a “self-published” work, remind them of the Hogarth Press. Read something by someone from another country. And the next time you pass a library, see if you can’t bring one of your own heroes back to life. Judy Swann is a poet, essayist, editor, and bicycle commuter, whose work has been published in many venues both in print and online. Her book, We Are All Well: The Letters of Nora Hall has given her great joy. She loves. She lives in Ithaca, NY.